There's already been one revolution in navigation over the past couple of decades, with the change from printed maps to satellite navigation. Now there’s new technology on the way that will further transform the way we position ourselves on the globe. With today’s satellite navigation technology we have the ability to access positioning information at the touch of a button, from in car navigation systems to smartphones and activity trackers on our wrists. With help from AuScope, the next generation of positioning technology will accelerate new and innovative uses of positioning information – many of which are yet to be imagined. A big leap in accuracy, availability, and reliability is being made available free across Australia, thanks to the Australian Government’s commitment in Budget 2018-19. The investment of $224.9 million will allow Geoscience Australia to develop world-leading positioning capabilities that will help shape the future of industry and business in Australia. Geoscience Australia will dedicate $160.9 million of that investment to develop an operational Satellite Based Augmentation System, commonly known as SBAS. 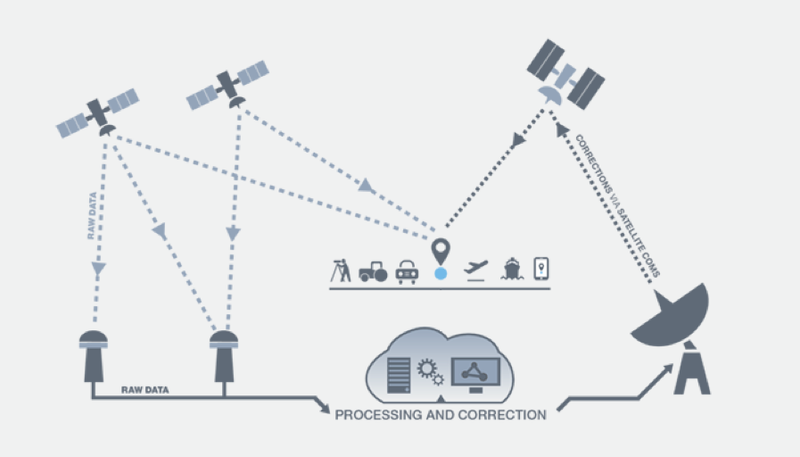 An SBAS will deliver corrected positioning signals, such as that received from GPS, directly to the user through satellite technology, improving the accuracy, availability, and reliability along the way. An SBAS will ensure reliable positioning data accurate to 10 centimetres is available throughout Australia, including its maritime jurisdiction. Schematic diagram of SBAS where positioning accuracies of 10 cm will be available across Australia, providing a world of possibilities for new technologies. Image: Geoscience Australia. The remaining $64 million is dedicated to upgrading Australia’s Global Navigation Satellite Systems, GNSS network through the National Positioning Infrastructureproject. The project will establish the necessary ground infrastructure to enable data from global networks of satellites to be tracked, verified and optimised for precise positioning with an accuracy of three centimeters across Australia in areas with mobile coverage. Together these projects aim to build an integrated and interoperable capability that will provide instant, accurate and reliable positioning information for all Australians anytime and anywhere across our nation. The majority of Australians can only position to 5 metres accuracy with current technology. In the near future, the NPI will provide accuracy of 3cm in areas with mobile coverage, enabling emerging innovation such as semi-autonomous vehicles to enter existence. Image: Geoscience Australia. Today, accurate positioning technology requires dedicated equipment with the right hardware, software and communication links – and this is expensive. Australia stands to benefit significantly from building upon the hundreds of ground stations that have been installed across Australia by private industry, and federal, state, territory and local governments. AuScope Geospatial played a key role in the development of this infrastructure, with a critical injection of funding and establishment of the framework under which Geoscience Australia has worked with state and territory governments to build world-class GNSS infrastructure. This includes a network of over 100 GNSS ground stations and the systems and tools to deliver data to the science and research community. 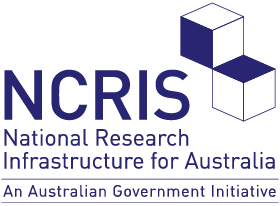 “The AuScope GNSS network will be an integral part of the NPI project, contributing to an interoperable network of ground stations across Australia. This network will help enable centimetre accurate positioning which is essential for a wide range of applications, now and into the future”. The AuScope GNSS network will be used to observe signals from the GNSS satellites for Geoscience Australia to analyse and compute corrections which can be utilised by the user. “We knew there would huge benefits from positioning technology, but we didn’t realise how quickly we’d be in the position where, not only can we make corrections to achieve greater accuracy, but will be able to provide decimetre accuracy across the whole of Australia,” explains Dr. Dawson. Using the accurate positioning data from Geoscience Australia, commercial providers will be able to value add and provide additional capabilities for their customers. 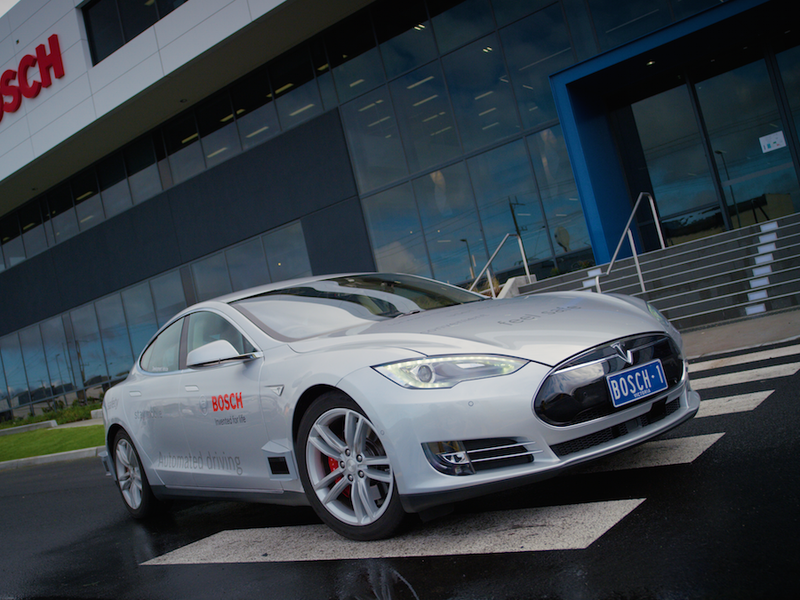 The future of driving was on show at the 2017 Melbourne Grand Prix Circuit, as VicRoads tested a highly automated driving (HAD) vehicle fitted with world-first satellite positioning technology. Image: Bosch via Business Insider Australia. The technology will help grain growers to control sowing and harvesting along accurately guided tracks – maximising the cropping area and increasing yields. 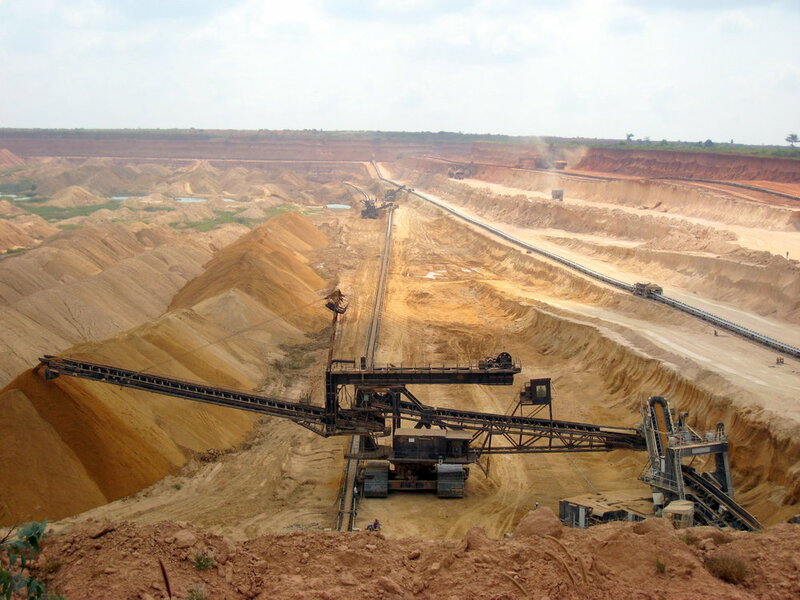 In mining, positioning technology is already used extensively for activities right along the production chain, from surveying sites to extracting ore and transporting it. ‘In Perth, the mining company Rio Tinto has a central hub where the staff are operating trucks, trains, conveyor belts and transporting mining ore, all behind a computer screen using positioning technology,’ Dr. Dawson said. In construction, this technology is used for site surveying and machine guidance. And in research, highly accurate positioning allows geodesists to monitor changes in movement of the Earth’s crust, which tells us about the rate of plate motion, stress build up and even seasonal changes in the groundwater. Location-based services is a market that is anticipated to grow significantly with accurate and reliable positioning technology. For example, positioning technology will transform the way we will locate underground utility services. In future, by standing with a smartphone or tablet at a building site, you could identify exactly where underground pipes or cables are located. There are six global navigation satellite positioning systems, operated by the United States, Russia, Japan, the European Union, China, and India. Together these systems have more than 80 satellites orbiting the Earth. Australia is one of few countries that can receive positioning signals from all six systems. Each satellite transmits information about its position and the current time. The signals are picked up by your receiver, such as a smartphone or car navigator. The receiver calculates how far away each satellite is based on the time it took for the messages to arrive. Using the location of at least four satellites and their distance from you, the receiver pinpoints your location. But small errors creep into the measurements made by the navigation receiver. There are several causes, including a slight slowing of radio waves through the ionosphere, variations in satellite timing and variations in satellite orbit. Even accounting for these errors, existing systems identify a user’s location with an accuracy of five metres. That is the system used today in car navigation systems and in smartphones. By correcting these errors, Geoscience Australia will significantly improve the accuracy of satellite positioning in Australia. It will achieve this through, two projects – SBAS and the NPI project. For more information about this story, please contact Nicholas Brown, AuScope’s Geodesy & Geodynamics program leader at Geoscience Australia.